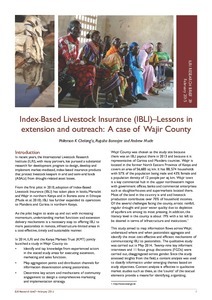 A new research brief by the International Livestock Research Institute (ILRI) shares lessons in extension and outreach from the Index-Based Livestock Insurance (IBLI) project activities in Wajir, Kenya. The findings are from a 2014 study by ILRI and the Kenya Markets Trust which mapped information flows across Wajir County, assessed where and when pastoralists aggregate and identified the most cost-effective and efficient mechanisms of communicating IBLI to pastoralists. 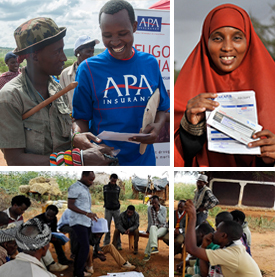 Among other findings, the study identified ‘a gap in the relationship between agents and pastoralists in the county, which influences the IBLI implementation process. Tags: IBLI, Wajir. Bookmark the permalink.